HMSHost presented at the fall National Restaurant Association's Board meeting to the Sustainability & Social Responsibility Committee. Linda Dunn, HMS Host VP Supply Chain & Analysis, gave an excellent overview of HMSHost's substantial commitment to sustainability throughout their operations and extending to community service. With nearly 100 airport airport concessions contracts around the globe, annual sales in excess of $2.5 billion, over 34,000 associates worldwide and an unmatched portfolio of over 250 international, regional local and proprietary brands, HMSHost is a powerful leader who is evolving the operating standards of the foodservice industry. “Making the traveler’s day better” by reassuring our customers, partners, and employees that HMSHost has a sustainable, responsible foundation. Identify additional target organizations & alliances to join, support or participate in; become a collaborative voice to develop realistic solutions. Increase depth of HMSHost’s knowledge of sustainability issues, potential solutions and external resources. Identify additional best practices (internal and external) and communicate across our system. Get acknowledgement for our progress. It is inspiring to work with Linda and her team - as individuals they are driven by personal integrity and as corporate associates they are backed by their company's stated mission. Stay tuned for many exciting tales from the journey with HMSHost. The session ended with a lively Q&A lead by Lynn Dyer, FPI President. It is important for the elder of foodservice packaging trade associations to educate their members on sustainable trends, soon to be required standards for venue and other contracts. At this juncture, those embracing sustainable packaging are pioneers and leaders yet the tables are ready to turn from leadership to requirement. The day ended with a fantastic reception and dinner at the Brown Palace Club. Invigorating conversations flowed about product development opportunities. As an active Sustainable Food Court Initiative Team Member and Ei Advisory Council Member, Lynn is an industry leader educating herself and FPI members on the evolving packaging landscape. It is an honor to work with Lynn on the SFCI projects and include her valuable insights as the pilots launch. For pictures of the meeting as well as scenic downtown Denver, visit the Ei FB album, 09-21-11 FPI Mtg in Denver. Kudos to Lynn and her FPI staff for hosting an excellent meeting! The Zero Waste Zones Team is visiting the Charter ZWZ Participants to learn about their zero waste successes and challenges. In addition to zero waste initiatives, the participants share their overall sustainability commitment with common and unique projects. How fun to take a tour of the Sheraton - Downtown Atlanta and see the bananas (yes, real bananas that may be destined for luscious Bananas Foster or another decadent treat!) growing in their indoor|outdoor saline pool area. The Sheraton's saline pool keeps 450 gallons per month (5,400 gal per year) of harsh chlorine chemicals from eventually ending up in Atlanta's sewer system. In mid|late fall the Sheraton intends to replace their trash compactor with a recycling compactor. The ZWZ Team is encouraging a formal ribbon cutting ceremony - stay tuned for the blog post of the celebration. As the elder of the major downtown hotel conference centers, the Sheraton boasts a tree-filled property in the midst of the bustling Atlanta convention district. A visit to the Sheraton is worth the time to take in the front-of-the-house sustainability and aesthetic commitment. Know the behind the scenes operations retain the integrity, complete with reusable dishes and food residual collection for composting in their employee cafeteria. Visit the IMPACT Blog post, Sheraton Atlanta POWERS New Energy & Identity, for more details on GM Niles Harris leadership role in greening the hotel industry. WOW is an accurate explanation when touring the Georgia World Congress Center's recycling and sustainable programs. Tim Trefzer, GWCC Sustainability Manager, joined the GWCC Team in December, 2010 (see the December, 2010 ZWZ Blog post, GWCCA Walks Their Talk, announcing Tim joining the team) and is one BUSY, effective young man. In the August, 2010 ZWZ Blog post, GWCC Hits Recycling Stride, the impressive recycling stats and other accomplishments under Tim's reign are detailed. To ensure contamination is kept at a minimum the GWCC keeps a padlock on the recycling compactor, which is located in a secure area. Tim understands the importance of clear signage to effective recycling programs and the loading dock area is abundant with easy to understand recycling signage. The employee cafeteria uses compostable, disposable products that are collected by Closed Loop Organics, along with food residuals, for composting at Greenco Environmental's Barnesville facility. Lighting is kept at 50% during event move-out to save on energy use and cost. It was nice to see Freeman use older corrugated boxes held together with duck tape for event material transport - reuse is important! For a pictorial recap of the Sheraton & GWCC tours, visit the Elemental Impact FB Album, Fall, 2011 ZWZ Participant Tours. ZWZ Participant tours are in the early stages - stay tuned to learn about the Pioneers' sustainable ingenuity and explore how it may be adapted to your operations. These are thrilling times! The City of Columbia, SC hosted their annual 'Green is Good for Business' annual conference in partnership with the SC Department of Health and Environmental Control. With excellent attendance, the conference was an opportunity for SC businesses to understand the green side of business is also the profitable side. Harris DeLoach, Sonoco Products Company Chairman & CEO, gave an excellent keynote session, Sustainability and the Bottom Line, to begin the day's events. Thomas Deem and Anthony Soto of The Boeing Company followed with Boeing's Approach to Sustainability as it pertains to the construction and operations of the new N. Charleston plant. The remainder of the day was filled with informative break out sessions along with plenty of time to network with the conference exhibitors. Zero Waste Zones Director Holly Elmore presented a morning session on Zero Waste Zones, Mobilizing an Industry to Make a Difference. With Tom Sponseller, SC Hospitality Association President & CEO, in the audience the session was a perfect tie-in to the ZWZ-Columbia in the exploration stage. See the ZWZ Blog, ATL Zero Waste Team Hosts SC Hospitality Tour, for an overview of the August SCHA & City of Columbia ZWZ Atlanta tour. Ron McCoy, General Manager of Select Comfort's Irma, SC plant, gave an inspiring and fun talk on the plant's zero waste success story. In his session Roy emphasized going green is evolutionary - a journey, not a destination. To control contamination, the plant's recycling compactor has a pad lock with only three designated employees permitted to fill it with material. The Select Comfort story is a prime example of how green|zero waste efforts build strong bottom lines while treating the environment with respect. According to the conference brochure, all session PPT presentations will be available on the City of Columbia Climate Protection Action Campaign site. The Elemental Impact FB album, 09-13-11 Green is Good for Business Conference - Columbia, SC. gives a pictorial recap of the conference along with some lovely pictures of the SC State Capitol grounds. Thanks to City Councilman Daniel Rickenmann's generosity and hospitality, the two evenings in Columbia were filed with excellent company, cuisine and wine! At the conference there was talk about a second Atlanta ZWZ tour for the government and area recyclers|haulers. Keep informed on the ZWZ Blog as the pathway is built for ZWZ-Columbia, the first expansion city! Columbia, SC is home to one of the first, if not the first, U.S. anaerobic digestion facilities permitted for food residual intake. Thanks to Daniel Rickenmann's ingenuity and tenacity, the W2E Organic Power $23 million facility is set for ground breaking in early fall, 2011 with waste processing beginning in 2012. 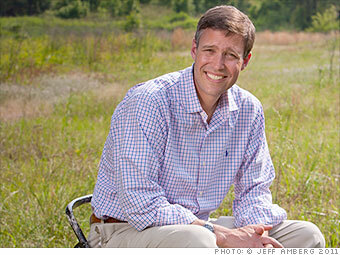 As W2E's Founder & CEO, Daniel pulled together a dynamic team including Eisenmann and CIYCOR. W2E serves as the facility developer and operator using Eisenmann's technology and engineering expertise. CIYCOR is the co-developer and financial partner, who committed to a series of W2E facilities. Announcements are planned in the near future for Gastonia, NC, and Baton Rouge, LA. systems. In lay person terms, anaerobic digestion systems create a vacuum for food and other organic matter to quickly decompose without air (anaerobic). Methane gas is generated in the controlled environment and used to produce natural gas, condensed natural gas (CNG) or electricity. Food breaking down in landfills also produces methane gas yet in an uncontrolled environment. Even when gas is collected at a landfill, the majority of the methane escapes as a greenhouse gas, 20 -25 times more potent than carbon dioxide. Traditional commercial composting operations include the use of windrows (piles of food residuals & yard trimmings|wood chips) where the organics decompose in an aerobic (with air) environment due to "turning the windrows" at regular intervals and the passive movement of air through the piles. Well-managed composting operations do not produce methane gas. 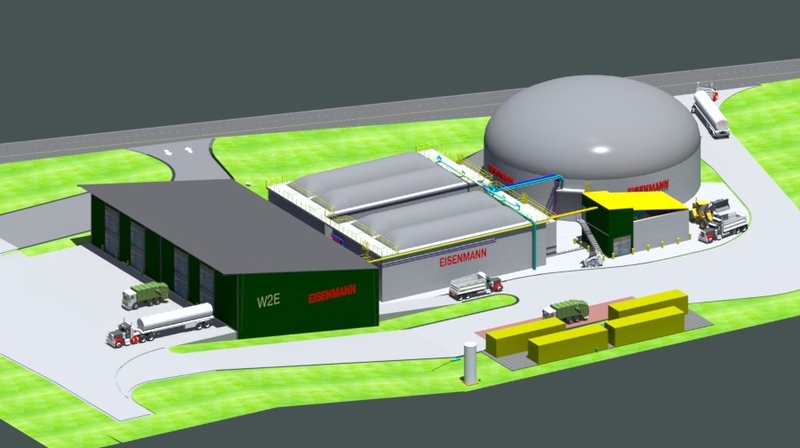 Anaerobic digestion systems are common in Europe, especially Germany. The significant capital costs required to build anaerobic digestion plants combined with abundant landfills and traditionally low tipping fees has prevented the U.S. from embracing the technology. It takes committed pioneers like Daniel to create a strong business model where high capital costs and low landfill tipping fees and energy costs are the foundational parameters. Prior to ground breaking, W2E has a variety of commercial waste stream commitments including Blue Cross Blue Shield, Dorado Farmers’ Market, Harvest Hope Food Bank, McEntire Produce, Palmetto Health, Pascon Solid Waste Hauler,Quest Recycling, Pontiac Foods, Walmart and WP Rawls. With the City of Columbia and the South Carolina Hospitality Association exploring a Zero Waste Zones - Columbia (or was that ZWZ-SC?! ), W2E may serve as the destination for food residuals generated by Columbia's foodservice & hospitality operators. See the ZWZ Blog post, ATL ZWZ Team Hosts SC Hospitality Tour, for a recap of the August, 2011 SCHA ZWZ tour. In addition to securing the facility feedstock, W2E has a long-term Power Purchase Agreement with Santee Cooper, SC's state-owned electric and water utility, to purchase the electricity produced from the methane gas generated at the facility. Read the September 01, 2011 Eisenmann press release for additional details on the W2E Columbia, SC project announcement. A close friend of Elemental Impact, Daniel presented at the Spring POWER - Perishable Organics Waste to Energy Recycling - meeting on the Columbia W2E project. See the ZWZ Blog, Spring POWER Meeting is Stellar, for a meeting recap. With strong synergies, Ei|ZWZ plans to work closely with Daniel and his team as he uses the Columbia flagship facility to develop a template for a series of systems throughout the Southeast. Follow the ZWZ Blog to keep current on the milestones achieved in diverting organics from landfills and to energy use. USCC Prepares for New Era! New ZWZ Site is LIVE! ZWZ Blog Tops 20,000 Views! !